As you know, Facebook is slowly killing organic reach for brands, so you’ll either need to pay to advertise there in the near future or get really, really good at sorting out its ever-changing EdgeRank algorithm. Some pages are attempting to beat EdgeRank by generating likes and other Facebook actions any way they can. Have you fallen victim to their ploys? Here’s one to watch out for. It isn’t always a bad thing to attempt to “game” Facebook. Throwing up a cat meme or a (not too offensive) card from Someecards from time to time can’t hurt, assuming that it’s somewhat relevant to your brand. 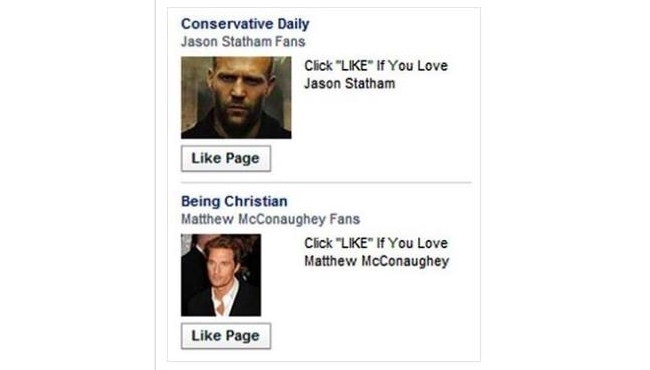 But some practices are pretty shady, like creating misleading ads to generate likes. Do the pages above have anything to do with being fans of the actors pictured? Nope. Will it work? Sure! Each page apparently took advantage of Facebook’s robust targeting tool on the back end, and the clever ruse will likely generate lots of likes. Why should you avoid these tactics if they work so well? You shouldn’t — avoid them, that is. They work, and if you can reach your target audience that way, so be it. But you need to be careful when using such a blatant bait and switch, as you don’t want a bunch of angry folks swarming your page with negative posts telling you off. It could be a credibility killer. Or, then again, it could be yet another way to beat EdgeRank. It’s interesting to note that Facebook is allowing these bogus ads to run when they’re so blatantly unrelated to the topic they’re promoting and, very obviously, violating someone’s copyright with those images. If you plan to try your luck with this tactic, better sooner than later, as it will likely be caught soon. Or maybe Facebook won’t care as long as you’re paying to advertise. 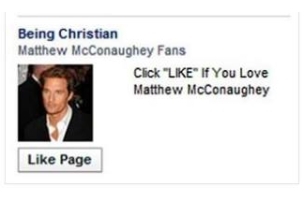 Readers: Have you seen misleading ads attempting to generate likes? How do you feel about using them to promote your business?